Hinckley winger Sam Driver believes his side have got the confidence to continue their excellent start to the season – but insists their mindset for every game must remain the same. Photo Credit: Steve Wells. 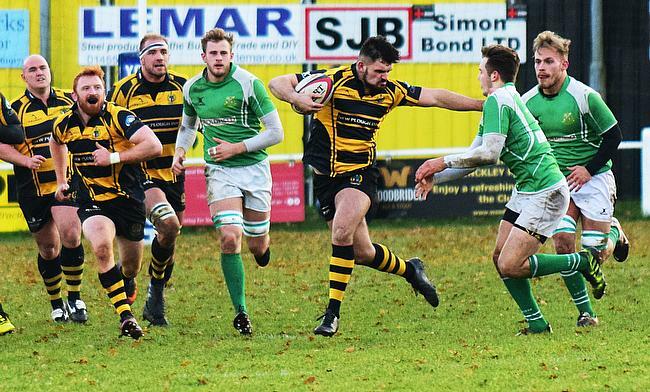 The Hornets head into Round Seven on top of National Two North after securing their sixth consecutive victory over South Leicester last weekend. It has been a superb beginning to campaign for the Midlands club and as things stand, George Chuter’s men sit four points clear at the summit of the division. Asked whether Hinckley can maintain their early season form, Driver said: “We sort of hoped we would be in and around the top of the table after doing quite well at the beginning of last season. “We had a couple of games in the middle of the season which didn’t go our way and we unfortunately drifted off after that as other teams capitalised on our misfortune so we are more than happy with the start we have made. “We have got the confidence to stay up there at the minute. We are playing some very good attacking rugby and our defence seems to be holding up very well too. “We’re just focused on what we are doing rather than worrying about the abilities of other teams who are competing with us. We have a good bunch of lads who are all very supportive and together so it is going well at the moment. At this stage last season, Hinckley did look like possible promotion contenders, but their patchy form at the start of 2018 hampered their progress. However, Driver feels the way his side now approach games has had a positive impact on their performances this term. “I think the group attitude has changed and you can see that in training and turning up for games,” he added. “We have just got that mindset of knowing how we all can play now. Last year and the year before, there were areas which we could’ve improved on and now we want to go in with the attitude that every game is a cup final. Hinckley’s mindset was highlighted in recent victories over Hull Ionians and Stourbridge. The Hornets were reduced to 14-men after just 29 minutes against second placed Hull, but the Midlands club managed to seal a 35-24 win at Leicester Road. Against Stour in Round Five, where Driver scored his first try of the season, Hinckley came from behind on two occasions to clinch the victory. Driver said: “Hull Ionians were a big test and it showed how well we are playing at the moment to go down to 14 men and comeback to beat them. Driver is one of a few current Hinckley players who have been associated with the team since their days in the fifth tier of English rugby. The winger did spend a year playing in New Zealand, but returned to the Midlands under the leadership of George Chuter. Since Chuter’s arrival at the club, Hinckley have continued on an upward trajectory following their promotion in 2016 and Driver is delighted to be able to play a part in the Hornets’ journey. He added: “It is great to be involved with this club at the moment. I think when George came on board, we had confidence in his plans for the club. “It is brilliant he is with us and he helps the players know where they stand as well as what we need to improve on. “Even in these games when we put in good performances, it is not a case of sitting back and reflecting on how well everything went. We are always looking to better ourselves. Hinckley’s next assignment is a trip to fifth placed Chester this weekend and the Cheshire outfit have won their last 10 games on home soil. The men from Hare Lane were also one of the first teams to beat Hinckley last year, but Driver admits his side have the belief to maintain their winning run on Saturday. “Chester are a good side and we are fully aware of that,” said Driver. “Last year when we played Chester away, we had bad weather and you couldn’t really tell who was on whose team because of the conditions so it will be a different setting this year with their 3G pitch! “Last season, was the game where we lost after our best run of form of the year [eight game winning streak] and I don’t think we gave them the respect they deserved. “We have got that belief. Belief is a good word to use. We believe we are good enough and better than every team we are coming up against.